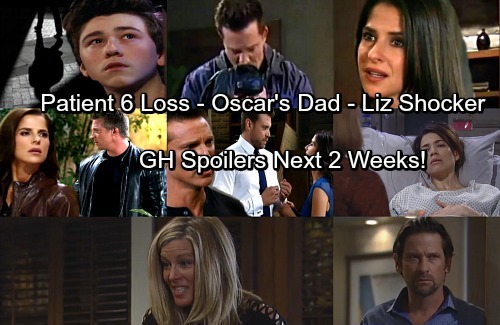 General Hospital (GH) spoilers for the next two weeks tease that some hot drama’s coming up. The week of October 30-November 3 will bring a dilemma for Nathan (Ryan Paevey). He was all set to quit the Ask Man Landers charade, but Maxie’s (Kristen Storms) bright idea will pull him back in. As Maxie presses her luck, Nathan will wonder how much longer he can keep this up. He’ll be ready to conclude the ruse, but some twists will really throw him for a loop. Finn (Michael Easton) will get fed up with his scheme as well. He’ll tell Anna (Finola Hughes) he wants out, but she won’t let him walk away just yet. Elsewhere, Josslyn (Eden McCoy) will manage to pry some info out of Oscar (Garren Stitt). He’ll open up about some family issues and Joss will continue to search for hints about his dad. While Oscar and Josslyn make progress, Patient Six (Steve Burton) will have a tense chat with Carly (Laura Wright) and Jason (Billy Miller). Sonny (Maurice Benard) will do his best to mediate, but it won’t be easy. Dante (Dominic Zamprogna) will soon put a few puzzle pieces together. He’ll realize that someone with Jason’s old face is definitely in town, but he won’t be sure what to make of that. Michael (Chad Duell) will get updates on Dante’s suspicions, so he’ll also be pretty perplexed. The week of November 6-10 will deliver another round of messy circumstances. GH spoilers say Patient Six will reflect on everything he’s lost. He’ll have a hard time coping, but he’ll try to hang in there. Curtis (Donnell Turner) will be hard at work for Jason’s sake and he’ll uncover some stunning news. He’ll send a text that leaves Jason with even more questions. Will Curtis come up with some clues about Jason’s twin? Franco (Roger Howarth) could pitch in here, but things will be tricky thanks to Andre’s (Anthony Montgomery) revelations. Perhaps Franco will worry about the risks that the truth will bring. Nevertheless, Liz (Rebecca Herbst) will face a shocker. It sounds like it might be her turn to come face to face with Patient Six. Other General Hospital spoilers say Amy’s (Risa Dorken) fears will grow stronger. You can bet that it’ll be Maxie’s (Kirsten Storms) fault. Amy’s true role in Ask Man Landers is on the verge of getting out. Nathan’s career will be at stake once his lies are exposed, so Maxie will certainly be in a jam. Across town, Nelle (Chloe Lanier) will make a bold move that could lead to trouble. Dr. Klein (Gene Farber), on the other hand, will feel like his luck is turning around. Patient Six had better watch out! We’ll keep you posted as other General Hospital details emerge. Stay tuned to ABC’s GH and don’t forget to check CDL often for the latest General Hospital spoilers, updates and news.